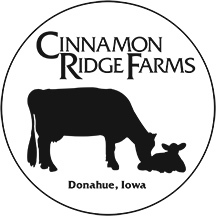 Cinnamon Ridge is interested in quality people joining our team. We offer job opportunities in our quality dairy herd, tourism, which includes leading tours and preparing nutritious, catered dinners and lunches for our groups visiting us. We offer learning opportunities for students wanting to intern at our farm to continue or complete their education. Position available on 220 cow, family-owned, robotic dairy farm. We also have dairy beef and a cow/calf operation in East Central Iowa. MUST be responsible and dependable, quick learner and independent thinker. General dairy farm knowledge is desired, but not required. ​This position is an entry position to grow as skills are acquired. Responsibilities include cleaning of cow/heifer/calf stalls, operating and maintaining dairy farm equipment, and other farm jobs when needed. Salary and benefit package based on experience and education. Contact us for employment opportunities! We could love to hear from you!